Can it really be 2 years since I've posted an entry here? Yes! Yes, it can. And yes it has been. I want to thank you early readers who've hung in there patiently waiting for me to write again, and those of you who recently stumbled across my blog and who have also encouraged me to start writing. I also want to thank Stephanie Pearl McPhee who so kindly mentioned my name in her blog last week which directed some of you my way. For those of you who read Steph's blog (and who doesn't?) yes, its true I do carry a human spine with me when I travel to teach some of my ergonomics classes. Fear not! It wasn't actually ever alive. Its just a plastic model. That said, it has raised eyebrows going through security at many an airport. I recall in particular going to teach at Sock Summit in 2009. My spine was sharing the suit case with a whole bunch of metal knitting needles poking in every direction around the spine. As the suitcase went through the x-ray machine the security agent stopped it with a puzzled and slightly horrified look on his face. He called for back up. "Rats", I thought. "They're going to confiscate my Addi's". The second security agent arrived and looked at the image of sharp pointy things aimed at and apparently through the human spine-like thing. The two looked at each other and shook their heads in an, "I don't want to know" kind of way and sent the bag on through. So, you might well ask, "What have you been doing that stopped you from posting for two years? Its not like no one was reading". To which I'll simply reply, "living and learning" - some of it the hard way. I've also been flogging myself for taking so long to start this up again and finally caved under the weight of my own nagging to do so. Many things have changed in my life. I'm experiencing a lot of new beginnings after a lot of sad endings. Its time to begin writing to you again because too many of you are still getting hurt while you knit or spin. It causes me to lose sleep. I can't afford that.I need all the beauty sleep I can get. So let's talk a little about something that several people have written to me about. Its called De Quervain's Tenosynovitis or De Quervain's for short. Its a painful inflammation concerning the tendons that run along your forearm to the base of your thumb and allow it to extend and move away from the hand. These tendons travel through a tunnel or sheath which becomes inflamed with over use, repetitive movement, and working in an awkward wrist or thumb posture. Our thumb has a unique, saddle shaped joint at its base which allows the thumb its great range of motion, especially opposition or the ability for it to cross our hand. Since its our thumb's unique anatomy that helps put us at the top of the food chain, we're rather fond of using it to do most of the things we do. So you can imagine then, that having De Quervain's is at the very least inconvenient. Symptoms of De Quervain's include pain with moving the thumb or wrist - especially pinching. 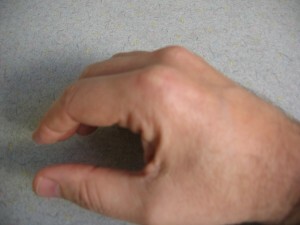 It is possible to have swelling around the wrist at the base of your thumb. Stiffness with thumb and wrist movement is another common complaint. But wait, do knitters ever employ repetitive movement? Do they ever work in awkward wrist or thumb postures? Do they ever just not know when to put their needles down? Not on my watch, soldier! But seriously, before you blame your knitting look at the bigger picture of how you use your hands and wrists. New moms and dad's often experience De Quervain's from they way they lift their child. I remember seeing more than one patient with it after Harry Potter and the Order of the Phoenix came out. Why? Because its a thick heavy book and no one could put it down. Holding a big book pinched between your thumb and the rest of your fingers is a good way to stir things up for these tendons. I love J.K. Rowling and no one is a bigger Potterhead than I, but honestly! Lie the book down or use a book rest instead of pinching to hold it. De Quervain's prevailed in the clinic until everyone had finished reading Deathly Hallows. If you peruse the internet you're likely to see that the chief demographic to be afflicted with De Quervain's is women between 30 and 50 years of age. We all know that everything on the internet is true, but I've got to tell you that in my purely anecdotal experience this problem seems more prevalent among 20 to 30 year-olds, regardless of gender. What are they all doing that curmudgeons such as I aren't? Texting, my friends. (Not my friends. Their friends. You're my friends - never mind.) Thumb texting is the perfect movement to irritate this tendon. So too are the awkward wrist postures caused by laptop computer use and for many, the use of a mouse. So before you blame your De Quervain's on your knitting ask yourself how much of these other things you might be doing. And then observe yourself to see if you're doing them with awkward postures. Neutral wrist posture is one in which the wrist is not extended, or flexed. It is not deviated toward the thumb or little finger. It is neutral. It is difficult to knit some stitches with a neutral wrist posture but it is entirely possible to compute, read a book, lift a child, and use a wand with neutral wrist posture and without exerting too much force from the thumb. The problem is that we're often not aware of the awkwardness of the posture (until it hurts) because we're used to it. So try this. To give yourself a little feedback on your wrist or thumb posture, put the joint into a neutral posture (as described above), The easiest way is to simply rest your hand and forearm on a table so they are both in contact with the table and the wrist is straight. Then use your other hand to put a piece of cellophane tape across the wrist about an inch or so above and below the joint. Now when you move the joint out of neutral the tape will pucker or pull and remind you that you're not in neutral. Do this during computer use or if there is another repetitive task that you perform where you may fall out of neutral posture. If you observe good posture during these tasks you'll likely be able to afford a little awkwardness in your posture when you need it for knitting. I'm not saying that you should not pay attention to hand posture while knitting or that knitting can't contribute to the problem of De Quervain's. I am saying that if you invest in good postures during activities where they are easier to maintain you'll have less strain on the tissue when an awkward posture is difficult to avoid, and thus you're less at risk for injury. So. pay attention to how you're gripping things - knitting needles included. Work close to the needle's tips to decrease the fulcrum effects of a long needle. For those of you who spin, pay attention to how you're controlling twist's entry with your drafting hand - particularly during short forward, worsted drafting. You needn't put a death grip on your drafted fiber. Simply hold it firmly enough to keep the twist from entering. If you do find yourself in the situation where you suspect you have De Quervain's I know you'll be wise enough to rest your hand. That includes putting down the needles, roving, spindles, and computer until things calm down. Rest is a key ingredient to treatment. Sometimes a splint called a "spica splint" is indicated. I've had patient's casted in a thumb spica to force rest of the tendons. Doctors and physical therapists will likely recommend cold packs or ice massage to the area and some doctors may recommend medications. You should always talk to your doctor before self-medicating. The acute phase of this injury is NOT the time for stretching or exercise. Let it calm down and then, preferably under the guidance of a physical or occupational therapist, gentle stretching, and range of motion exercises can begin. Be patient! Rushing back to tasks before you're healed will only extend the process. As difficult as it may be, please remember that your body is meant to heal. And it will! Soon you'll be back in the saddle again, too. Every stitch is a new beginning. Ergo, I knit. One of the perils of traveling is being exposed to the cornucopia of germs and/or viruses that book passage on the same flight, or stay in the same hotel as you just waiting to find their way into your nasal passages where they will set up camp. This is especially true at this time of year when the array of microbes is as diverse and plentiful as a Thanksgiving table. Mind you, I'm not a germ-a-phobe. But, having just spent the last week in bed with a nasty bug after returning from Rhinebeck and Stitches East, it does give me pause. Do you know what I hate most about being sick? Well everything really, but the worst part for me is that my already impaired patience disappears completely. Why aren't I better yet? Can I go to work now? Isn't there anything on TV besides the Golden Girls? (Forgive me Bea!) Plus its hard to focus when you're achy, coughing, and sneezing. And if the needles aren't giving me love (what do you mean I need to rip it out? Again!) then it just makes my temperature go even higher. But there is an solution to this plight, and an ergonomic one at that. When I can't focus on a project for more than 10 minutes then I make sure I have about 10 projects to work on. Now some people don't understand that one does not need to work a project until its finished before starting another. "That's why God invented stashes", I explain. Indeed, I've met serial knitters in my classes who see a project through until all the ends are woven in and the blocking is complete before they even consider their next project. "Knitting monogomists" I call them. Bless them. I wouldn't change them for the world. It just doesn't work for me, and not because I live in California. So with this bug depleting my patience and and further shortening an already dangerously narrow attention span my solution was to embrace the project polygamist that I truly am. A toe up sock - ten minutes. "God I'm bored!" A cabled vest - 15 minutes. "Not the Golden Girls again. Better start some mittens for Christmas." That shawl I started last winter - 20 minutes. "Time to design some winter hats." By day five of hosting this wretched bug I finally felt well enough to get out of bed. Huzzah! If I can sit, I can spin. (Don't go there! This is a knitting blog.) "Okay, that was good for half an hour. Maybe I'll work on that sock again." I pulled out my EZ books to learn some new tricks. I pulled out my Priscilla Gibson Roberts books to learn some old tricks. I pulled out my new Mary Scott Huff book to learn a tricky tubular cast on. I will admit that this abbreviated attention to any of these projects isn't a very productive way to work. And those of you who have come to my class know that productivity is an important part of ergonomics. It is equally as important as safety. (I'll give you a cough drop if you know the third ergonomic consideration!) However, the benefit of having lots of projects to work on and different crafts to engage in is that my muscles get lots of diverse movement, my joints get a varied range of motion (important considerations if you've just spent five days in bed with the flu), and voila injury is prevented. Not to mention it keeps me entertained and quiet which makes certain people around here very happy. Yes, there is an ergonomic advantage to having a variety of projects to work on! Now if you're a knitting monogomist, good for you! There is nothing wrong with that. You just need to make sure you're giving your body the variety of movement and position changes that your knitting project isn't. Stand up more frequently. Stretch a little more. And if you're a project polygamist and that special someone in your life doesn't get it, you tell them that its to help you prevent injuries. And tell them I said so! Today I'm feeling better. The books have been returned to their respectful places in the library. I'm deciding which of the 30 new projects will be finished and which will turn back into balls of yarn. And nothing hurts. Except my nose which, from all the blowing and sneezing, is red enough to stop traffic. Stay healthy and knit safely! Knitting can calm the soul and excite the mind. Ergo, I knit.